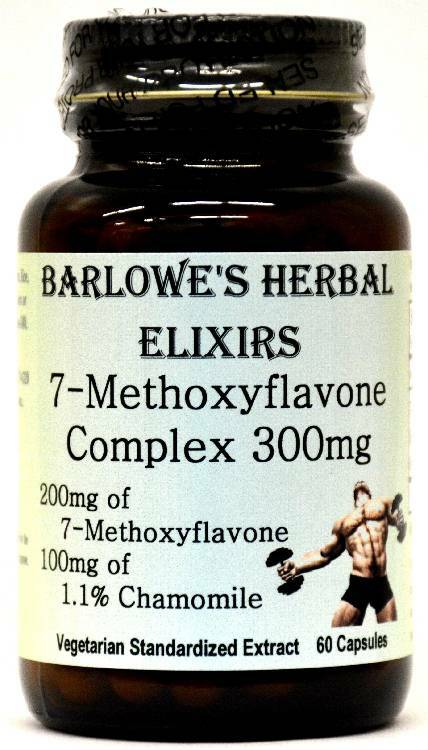 Barlowe's Herbal Elixirs now offers 7-Methoxyflavone - one of the most potent aromatase inhibitors available. These capsules are 200mg of 7-Methoxyflavone with an additional 100mg of Chamomile standardized to 1.1% Apigenin (also an aromatase inhibitor which is sold elsewhere on this site). Bottled in Glass! No Stearates! No Fillers! No Junk! 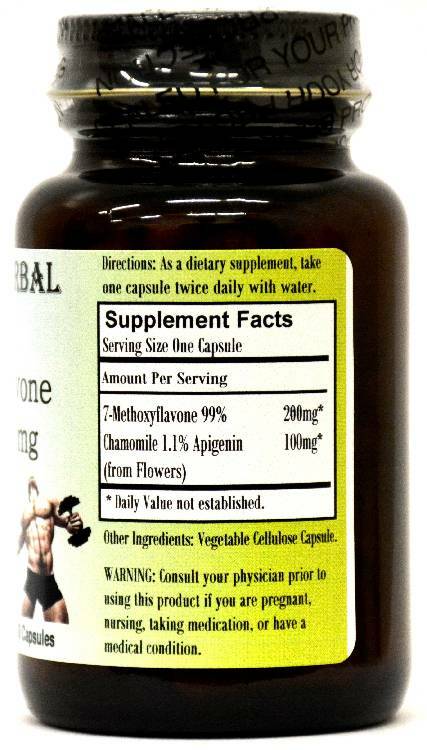 Barlowe's Herbal Elixirs proudly offers 7-Methoxyflavone - one of the most potent aromatase inhibitors available. These capsules are 200mg of 7-Methoxyflavone with an additional 100mg of Chamomile standardized to 1.1% Apigenin (also an aromatase inhibitor which is sold elsewhere on this site). Bottled in Glass! No Stearates! No Fillers! No Junk! 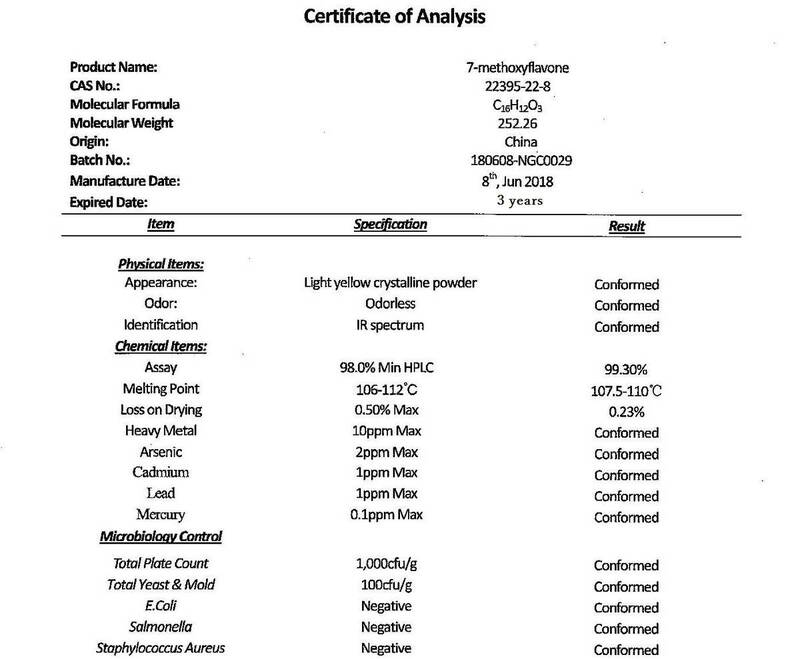 7-Methoxyflavone is a substance with strong aromatase inhibiting properties, superior bioavailability, and strong resistance to hepatic metabolism/breakdown. What is aromatase? Aromatase is a genetically regulated enzyme that binds to the most potent, masculine, anabolic compound in your body (free testosterone) and feminizes it, converting free testosterone to female estrogens. 7-Methoxyflavone binds to the aromatase enzymes and effectively inactivates them. This reduces the amount of estrogen in the blood stream, thus increasing luteinizing hormone secretion which in turn increases the body's production of testosterone. Caution: This product is generally safe, but it is potent and should be utilized with care. This product is for dietary use. If unexpected side-effects occur, discontinue use immediately! The above statements have not been evaluated by the Food and Drug Administration (FDA). This product is not intended to diagnose, treat, cure, or prevent any disease. Directions For Use: Take one capsule two or three times a day on empty stomach. Results and usage amounts may vary based on body type and weight. Write A Review For 7-Methoxyflavone A.I.